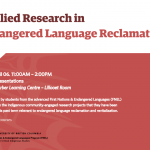 Presentations by students from the advanced First Nations & Endangered Languages (FNEL) 482 course on the Indigenous community-engaged research projects that they have been conducting this past term relevant to endangered language reclamation and revitalization. Carl Haber is an experimental physicist who has developed innovative technologies for the digitization of fragile, damaged, or obsolete recording media, thereby contributing immensely to accessing and preserving sound recordings of inestimable value to the cultural heritage of many Indigenous languages that otherwise are in danger of being lost forever. From June 22 to 24, 2017, the University of British Columbia and its co-hosts will welcome NAISA (the Native American and Indigenous Studies Association), the largest scholarly organization devoted to Indigenous issues and research, to UBC’s Vancouver campus on the traditional, ancestral, and unceded territory of the Musqueam Nation. Come celebrate 20 years of MIB-UBC FNLG/FNEL partnership with us! As part of our 20th anniversary celebrations, we invite you to join us at our end-of-term community potluck dinner. Please bring along some food to share and be ready to participate as students in the program present their work. Click above to learn more, and please RSVP by April 4th, 2017. All Our Father's Relations is a documentary featuring the family of Musqueam Elder Larry Grant, Elder-in-Residence at the First Nations House of Learning and Adjunct Professor for the First Nations and Endangered Languages Program. This talk will examine the unique aspects of traditional Indigenous knowledge systems that are at the center of Native American lifeways and culture. Through a decolonizing theory and framework, Jennifer O'Neal argues that it is imperative that these traditional knowledge systems must be the foundation and structure for the overall care and management of Indigenous archives, especially those at non-tribal repositories. Join us this Wednesday, March 15th as Caroline and Michael Running Wolf present an exciting talk on "Augmented and Virtual Reality for Cultural and Linguistic Continuity: Reigniting the Many Voices of a Communal Bison Hunt." 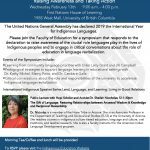 This symposium will bring together communities, institutions, traditional knowledge holders and scholars from BC, Hawai'i, Arizona, Oklahoma, and Ontario to address the current situation by sharing new approaches to adult learning and language fluency. Join Crystal Lameman, of the Beaver Lake Cree Nation, for a discussion of the just transition to a low-carbon economy from an Indigenous perspective. 'All Our Father's Relations' is a documentary film featuring the family of Musqueam Elder Larry Grant, Elder-in-Residence and Adjunct Professor for FNEL. A special screening will be held on Saturday, January 28, 7PM at SFU Woodward's downtown. Find out more here. The First Nations & Endangered Languages (FNEL) program, in collaboration with many other resource people at UBC, is hosting a week-long intensive Archival Institute for First Nations Languages from May 14-20, 2017. The application form is available here, and the deadline to apply is January 2, 2017. It is our pleasure to announce the world premiere of "All Our Father's Relations" at the 20th Annual Vancouver Asian Film Festival, which is nominated for the Best Canadian Feature Award. Join us on Tuesday, October 18th at the Sty-Wet-Tan Great Hall in the UBC Longhouse for a warm lunch hosted by FNEL. Join us on October 17th at 6PM at the Sty-Wet-Tan Hall, First Nations Longhouse, for an annual speaker series dedicated to global Indigenous rights. Chief Roger William (Xeni Gwet’in) will be speaking about developments in relation to the landmark Tsilhqot’in Title case since the Supreme Court of Canada victory in 2014. You’ve digitized vital community knowledge, but now do you wonder what’s next in both managing and providing culturally appropriate access going forward? The Indigitization Futures Forum brings together past participants with others concerned with the management of Indigenous Knowledge in communities. On Wednesday, March 2 at 11:30am, Professor Barbra A. Meek will deliver a public lecture called "Colonizing pasts, Indigenous futures: Imagining Indigenous languages beyond the present." Join us for a special talk by Daryl Baldwin on Feb. 22 from 11:30am-1:00pm on the strategies employed by the Myaamia community in their attempts to rebuild community through language and cultural education. Join us on Tuesday, January 26th at the Sty-Wet-Tan Great Hall in the UBC Longhouse for a warm lunch hosted by FNEL. Join us on Thursday, Dec 3 for a talk by FNEL Postdoctoral Fellow Jorge Rosés Labrada who will present an assessment of language vitality among the Mako people of Venezuela. Join Jorge Rosés Labrada, FNEL Banting Postdoctoral Fellow and Postdoctoral Teaching Fellow, for a talk about his research at the Totem Field Studios on October 23. What Counts as “Success” in Language Revitalization? On Thursday, October 22 at 11:30am, in the Lillooet Room (301) of the Irving K. Barber Learning Centre, Leanne Hinton will deliver a public lecture entitled "What Counts as "Success" in Language Revitalization?." Join us for a talk on "Linking Language, Culture, and the Environment: Twenty years of Biocultural Diversity Research and Action" by Luisa Maffi on Thursday, September 24 at 11:30am.